By Keith Cowing on July 31, 2006 8:36 PM. "Woz explained that he was participating in an expedition planned for December 2007 in which a group will drive Hummers running on hydrogen powered fuel cells from McMurdo Station to the South Pole. Woz said his particular vehicle would be co-piloted by Buzz Aldrin, who walked on the moon in 1969. The expedition is to be filmed in 3D for the director James Cameron." Editor's note: This strikes me as a Reality TV version of those "I'm a Mac/I'm a PC" commercials. By Keith Cowing on July 31, 2006 2:10 PM. "More than 60,000 people have registered to fly with Virgin Galactic since 2004, but only about 200 have paid full or partial deposits totaling about $16.4 million, according to the company. That money is refundable if flights, which would have six passengers and two crew, never take off. Its competitor, Virginia-based Space Adventures, which brokered three tourist flights to the international space station, has more than 200 reservations, but only $3 million in escrow. Oklahoma-based Rocketplane Kistler declined to disclose sales figures." By Keith Cowing on July 31, 2006 10:04 AM. "NASA is facing a real fiscal crisis. Even though the White House is demanding more, it hasn't given the space agency the funding it needs to build a launcher for the moon mission, pay an unexpectedly large bill for repairing the space shuttle and do everything else it committed to before Mr. Bush's Mars announcement. According to the space agency, NASA is diverting a little over $3 billion from its science research budget over five years." By Keith Cowing on July 31, 2006 12:09 AM. Preparations are still underway for the EVA med evac sim, which will take place on Monday. The following is a breakdown of the objectives of the experiment, provided by Dr. Rick Scheuring, DO, MS, Advanced Projects/Flight Surgeon (NASA-JSC). "Progress continued today on the med evac simulation, and things are shaping up well for tomorrow's test." By Keith Cowing on July 31, 2006 12:05 AM. "This first flight of Genesis is primarily a proof of concept mission for larger inflatable modules. However, it also carries some interesting scientific hardware, which could serve as the basis for future small free flying satellites - often referred to as smallsats or nanosats. Named "GeneBox", this small payload was developed by NASA Ames Research Center to test out new ways to perform in-flight genomic analysis of living systems. Indeed, much of what is being flown aboard this satellite is cutting edge biotech - the likes of which have yet to fly aboard the International Space Station. Future versions will be even more capable." By Keith Cowing on July 31, 2006 12:00 AM. "NASA's current acquisition strategy for the CEV places the project at risk of significant cost overruns, schedule delays, and performance shortfalls because it commits the government to a long-term product development effort before establishing a sound business case. NASA plans to award a contract for the design, development, production, and sustainment of the CEV in September 2006-before it has developed key elements of a sound business case, including well-defined requirements, a preliminary design, mature technology, and firm cost estimates." Continue reading GAO Has Doubts About Griffin's VSE Implementation. What is the Mars Society So Afraid Of? By Keith Cowing on July 30, 2006 11:43 PM. Editor's note: Two weeks ago I contacted Kevin Sloan, Marketing Manager for the Mars Society to request a press pass for the upcoming Mars Society convention in Washington DC. At first he said that he "looked forward" to seeing me at the meeting. Then he apparently changed his mind. After keeping me hanging for another week he finally got around to telling me that he would not allow me to attend and cover the meeting. NASA civil servants (Mike Griffin, Brian Chase, Scott Horowitz, Andy Thomas, and Chris McKay) are slated to speak in an official capacity. Alas, although I have a NASA HQ press badge, I will not be allowed to cover these official NASA speeches - and NASA finds itself embracing an organization that bans accredited news media from covering official NASA speeches. To be certain, the Mars Society can certainly ban anyone they wish from attending their meetings. However, an organization that seeks to deal with media coverage they might not like by simply banning that media is an organization that is afraid of external scrutiny. And what are they so afraid of? Is it that I say things they don't like about their leader, Bob Zubrin (but not about the membership)? Thin skinned people aren't going to lead the way to Mars. By Keith Cowing on July 30, 2006 3:08 PM. "In early February, the statement was quietly altered, with the phrase "to understand and protect our home planet" deleted. In this year's budget and planning documents, the agency's mission is "to pioneer the future in space exploration, scientific discovery and aeronautics research." "Deletion of the phrase "protect our home planet" from the 2006 strategic plan brought it into alignment with our statutory responsibilities and actual capabilities. Indeed, it was not clear that inclusion of the phrase made sense in the first place, since it raised questions that NASA is not able to address." Editor's note: Oh c'mon, Mike, this is just silly. The things that your predecessor did had the same White House approval as the things that you say and do today. OMB and OSTP go over all this policy stuff with a fine toothed comb before they sign off on releasing these plans - and you know it. The previous wording was just as much "in alignment" with the mood the White House was in at the time - when your Deputy Administrator worked there. If it wasn't they never would have signed off on the original document in the first place. As for what the phrase "protecting our home planet" means, it would certainly seem that these folks - and Congress - understand what part of the phrase entails (in addition to the officially taboo 'theory' of global warming). "On June 26-29, nearly one hundred scientists, engineers, astronauts, and managers from NASA, industry, and academia met in Colorado for an informal workshop to discuss how best to respond to NASA's new Congressional mandate to survey and characterize sub-km-diameter NEAs in order to understand and mitigate the threat of impacts by such objects." By Keith Cowing on July 29, 2006 11:39 AM. "In 2005, Congress passed a resolution requiring NASA to fund station science. "How can they fly in the face of that?" [Keith] Cowing asked. "If this item is a politically inspired activity for more (money), then it just shows how amateurish NASA is now when it comes to politics," Cowing said. "It's going to blow up in their faces." Cowing said NASA leaders have "virtually erased microgravity research on the station and now it seems they are trying to cut out life-science research." By Keith Cowing on July 29, 2006 12:03 AM. "Now the town is puzzled and saddened by reports of the circumstances of his death. According to Chuck McCarty, a dispatcher with the Sheriff's Office in San Juan County, Wash., Brady died of apparently self-inflicted wounds." "Retired space shuttle astronaut and DXer Chuck Brady, N4BQW, of Oak Harbor, Washington, died July 23 following a lengthy illness. He was 54." By Keith Cowing on July 28, 2006 2:47 PM. By Keith Cowing on July 28, 2006 1:34 PM. Editor's note: The Space Studies Board has been revising its membership. It is interesting to note that in light of NASA's continued cuts to astrobiology and space life science that the SSB has added Jack Farmer from Arizona State University, an astrobiologist and James Pawelczyk from Pennsylvania State University, a Neurolab astronaut and physiologist. Also, former NASA Administrator Richard Truly has joined and Tom Young is now the vice-chair of the SSB. Of course Lennard A. Fisk retains his chairmanship. By Keith Cowing on July 28, 2006 12:34 PM. The Arthur Clarke Mars Greenhouse Field Season 2006: Mission Accomplished! By Keith Cowing on July 28, 2006 12:10 PM. "More than 80 distinguished elementary and secondary school teachers representing nearly all 50 states and 24 countries will "graduate" this weekend from the world's first weightless "high school," also known as Northrop Grumman Corporation's Weightless Flights of Discovery program." By Keith Cowing on July 28, 2006 9:03 AM. "Some critics said NASA's proposal to eliminate station research entirely for 2007 might be going too far. "I'm startled that they would even discuss this with a straight face given that this would be dead-on-arrival in Congress, which has put it into law that it supports station research," said Keith Cowing, who runs the privately funded NASAWatch.com." Another NASA Volunteer For PAO to Ignore? By Keith Cowing on July 28, 2006 8:06 AM. "Strangely enough, despite a trip to the clinic yesterday for bloodwork and other reasons, I find myself forgetting that I'm lying down on Monday. This study has taken up roughly 70-75% of my brain since January when I first heard about it, and over the past few days I have caught myself thinking, "Oh yeah, that starts Monday." I am mostly excited, but also a little nervous. It's on par with an interview for a job I really want. But, as I have said before, everyone I have met that is connected with this study is beyond nice, beyond accommodating. Call me naive, but it seems like it could be smooth sailing for the most part. I'll deal with the hard parts when they come." Editor's note: George Viebranz is about to embark on an earthbound space voyage - a NASA-funded bedrest study at the Cleveland Clinic. Such research helps NASA to understand the effects of prolonged microgravity exposure upon humans. Earlier this year Erin Peterson went through the same research protocol. You have to ask yourself why someone would take three months out of their lives to help NASA do research that might benefit astronauts - unless, of course, that person saw a value to human spaceflight. As such, you would expect that NASA would be featuring the exploits of these volunteers (they get paid next to nothing). But no, NASA doesn't seem to care. Indeed, when Erin Peterson got media exposure on CNN, it was directly because of being previously featured on NASA Watch - not because NASA PAO lifted a finger to help promote this important research. Continue reading Another NASA Volunteer For PAO to Ignore?. By Keith Cowing on July 27, 2006 5:03 PM. "Keith Cowing, a former NASA engineer who edits the website NASA Watch, told New Scientist that the fact these two reports reached similar negative conclusions about NASA's plans should be a wakeup call. "NASA's plans are not well thought out, and the funding is not in place," he said. "Maybe it's time to step back and take a look at what's going on." By Keith Cowing on July 27, 2006 10:18 AM. Editor's note: NASA is considering shutting down all U.S. science aboard the ISS for a year or more for budgetary reasons. According to multiple sources, during the Space Station Program Control Board two weeks ago, Mike Suffredini issued an action to Code OZ (ISS Payloads Office) to evaluate the impacts of not funding any U.S. science on the ISS in FY07. This action would effectively eliminate science until Increment 19 in 2009. The underlying reason: to fix the funding shortfall of $100 million that exists from losing funds to Katrina and other funding pressures at NASA. The action was issued during a budget presentation by Richard Fox during which Suffredini was told that the ISS program has a $100 million shortfall for FY 2007. One of the impacts of shutting all science down for FY07 is that it will take as long as 3 years (FY08 - 10) to restore the capability to operate payloads aboard ISS. If implemented, the shut down would close the Payload Operations Integration Center (POIC) at MSFC, lay off both the contractor flight controller and facility support staff, as well as contractor staff at both JSC and KSC who support payload integration. Suffredini has not been given the results of this action - nor has he made any decision to shut down ISS science - yet. Suffredini could be briefed as early as this Friday (tomorrow). Some people in the ISS program feel that this may be simply a political exercise to show just how tight funds are. None the less, the immediate effect of this action item is to further lower the morale of many at NASA who already doubt the agency's commitment to doing what the ISS was originally designed to do: science. By Keith Cowing on July 27, 2006 12:10 AM. "On behalf of the Students for the Exploration and Development of Space, I am proud to announce our first ever National Students' Space Policy Proposal. This document was created to inspire senators, representatives, companies and space enthusiasts to consider the future generation's views and opinions on space development when supporting and implementing policy." By Keith Cowing on July 27, 2006 12:09 AM. Editor's note: According to Memorial Spaceflights "A public memorial service honoring James Doohan, L. Gordon Cooper and all of the participants of the Legacy Flight will be held on October 20th at a location near the launch site. Everyone is invited to share in this important, historic space mission and compose a message of tribute which will be included on board the spacecraft. Please click on the links at left to submit your message of tribute!" By Keith Cowing on July 27, 2006 12:02 AM. KEITH COWING: Follow-up. Then, can you release that documentation so that we can get an idea of how this would come about? JSC PAO PERSON: [interrupts] That's something we'll have to look into. Editor's note: It has been more than a week since PAO told me that they'd handle this request. I have heard nothing. Despite a conversation with Grey Hautaluoma immediately after this teleconference, and sending multiple emails to PAO to confirm that they are indeed looking into getting me the documents I requested, no one has bothered to reply - except one email from Kylie Clem telling me that someone else was going to take care of this. As such, I can only conclude that either NASA has a plan but they won't release it -- or they don't have a plan and they can't release it. Editor's 17 Jul update: Just as I thought PAO was ignoring me (after no feedback for a week) I got a call from JSC PAO telling me that they'd have some documents rounded up in a day or so. Editor's 27 Jul update: Well, it has been a week and a half since I last heard anything from JSC - and three weeks since I first asked for these documents. No one has provided me with anything. This obviously is not a priority task for them. I am getting the clear impression that they'd rather not discuss this topic in public. By Keith Cowing on July 26, 2006 2:34 PM. "In developing this strategy, NASA has apparently ignored key elements of the White House's Space Exploration Policy and several critical recommendations of the President's Commission on Implementation of U.S. Space Exploration Policy ("President's Commission"). Instead of planning its exploration transportation in a way that maximizes economic (and national security) benefit, NASA is working with its incumbent contractors to develop a series of government-designed and owned space exploration transportation systems to service ISS as well as explore the Moon." Continue reading SFF on Griffin's VSE Plan: You Can't Get There From Here. By Keith Cowing on July 26, 2006 12:57 PM. Editor's update: The solid rocket motor and microlander propulsion system notices have been cancelled. No reason has been given. "NASA Ames will become a West Coast 'space portal' for affordable small satellites and other scientific and commercial payloads," said S. Pete Worden, director of NASA Ames. "A small commercial launch vehicle may be a very attractive approach for providing affordable, responsive launch capabilities for bio-tech, lunar and other small spacecraft payloads of interest to NASA and commercial users." By Keith Cowing on July 26, 2006 10:26 AM. Editor's note: ESMD is ignoring this mission (even though they are paying for it) but SOMD (who is not paying for it) now makes overt mention of it on its Human Spaceflight page. Go figure. By Keith Cowing on July 26, 2006 12:01 AM. "NASA has formed an investigation board at Kennedy Space Center, Fla., to review the circumstances surrounding the injury of a construction worker at Launch Complex 39-A July 19." By Keith Cowing on July 25, 2006 10:20 PM. "These are interior photos from a portion of the Genesis I spacecraft currently in orbit. The images are a small sample of what we hope to produce in the "Fly Your Stuff" program. The blurred images are actual photos and items in flight. As these are all preliminary samples, they DO NOT accurately reflect the quality of image we hope to produce." By Keith Cowing on July 25, 2006 8:22 PM. Editor's note: This edited version of STS-121 launch video shows live RocketCam video next to the video from two other videorecorders mounted on the shuttle's solid rocket boosters. The three-camera perspective is rather unique. You can watch what the two SRBs do after they separate from the Shuttle and fall back to Earth while the Shuttle continues its climb to orbit. Other Ecliptic Enterprises launch videos are online here. By Keith Cowing on July 25, 2006 8:00 PM. Editor's note: Apparently no one in the U.S. or Russia has approved the Space Adventures plan to sell EVAs from the ISS. According to this Roscosmos press release "information for The Media" (in Russian): "There have only been some discussions about the possibility for a non-professional to perform an EVA. There is a set of requirements in order to implement this task. One of the future space flight participants would like to do an EVA. But at current time he has not obtained the appropriate approvals from the experts." By Keith Cowing on July 25, 2006 11:38 AM. "The Cassini spacecraft, using its radar system, has discovered very strong evidence for hydrocarbon lakes on Titan. Dark patches, which resemble terrestrial lakes, seem to be sprinkled all over the high latitudes surrounding Titan's north pole. Scientists have speculated that liquid methane or ethane might form lakes on Titan, particularly near the somewhat colder polar regions." By Keith Cowing on July 25, 2006 1:26 AM. "This image shows gullies on the wall of a martian south mid-latitude impact crater. The channels in each gully head beneath an eroding overhang of layered rock, providing support for the hypothesis that someif not allmartian gullies result from release of groundwater to the surface." By Keith Cowing on July 25, 2006 12:29 AM. "The House of Representatives today passed by voice vote, H. Res 892, a resolution commending the dedicated employees of the National Aeronautics and Space Administration's (NASA's) Michoud Assembly Facility, the "Michoud Hurricane Ride-Out Team", who risked their lives during Hurricane Katrina's assault on southeast Louisiana." By Keith Cowing on July 25, 2006 12:09 AM. "What we need is to let NASA be NASA. Shift the burden of less mission-specific projects to other interested organizations, allowing the agency to focus on the core science and exploration programs that it's best suited to do. These efforts don't necessarily provide the near-term relief that scientists crave but do accelerate the transformation of NASA into a science and exploration agency." Editor's note: Aw c'mon, Jeff. How lazy. Poor NASA. Everyone is against it. It has too much on its plate. Its not their fault. Yawn. You don't even bother to suggest that the way the agency operates needs to be overhauled - yet given a budget commensurate with what it has been called upon to do. Perhaps then it could actually do all of the things we expect it to do. I have confidence in NASA's ability to do just that - under the right leadership. You don't. Jeff Foust works for Futron Corp., a NASA contractor. I guess Jeff forgot to mention this to SEED Magazine. By Keith Cowing on July 24, 2006 10:34 PM. "Japan Aerospace Exploration Agency (JAXA) astronaut Koichi Wakata will lead the crew on a seven-day undersea mission July 22 to 28 aboard the National Oceanic and Atmospheric Administration (NOAA) Aquarius underwater laboratory ..."
Editor's note: The NEEMO 10 crew is already half way through their mission - yet NASA PAO - and its mission directorates - seem to be ignoring the project - again. If you go to the NEEMO site at NASA.gov there are no images or status reports. As far as the NASA portal goes the missions page has nothing on NEEMO - neither does the Breaking News page. Also, there is no mention on the Exploration Systems Mission Directorate page, Space Operations Mission Directorate page, NASA's Human Spaceflight page, or on JSC's news page. As far as I can tell JAXA has nothing online at all - searching their website for "NEEMO" yields no results. This is all rather odd since NASA PAO touted this crew's activities as follows: "... NEEMO 10 project will include undersea extravehicular activities imitating moonwalks to test concepts for mobility, using weighted backpacks to simulate lunar and Martian gravity. Techniques for communication, navigation and using remote-controlled robots on the moon's surface also will be tested." Indeed, if you look at this NOAA Status report from 22 July it says that "NEEMO 10 is sponsored by the Constellation Program at NASA. The Constellation Program is responsible for taking NASA back to the Moon and on to Mars." Why go through the expense of announcing a mission like this - and then carrying it out - if no one knows that it is happening? Since NASA PAO is dragging their feet you might as well just go visit the NOAA Aquarius Website directly - they feature live webcams. Editor's 25 Jul update: JSC's NEEMO page finally added journal entries - otherwise, the rest of the agency's websites continue to ignore NEEMO. By Keith Cowing on July 24, 2006 10:04 PM. "The Flamingo Las Vegas has become the unlikely epicenter of space-based commerce by hosting the third Lunar Commerce Executive Roundtable. The three-day event brought together 75 or so aerospace leaders, bankers and academics in a cooperative effort to develop new commercial applications and activities in space." By Keith Cowing on July 24, 2006 9:56 PM. "For the fourth year George Mason University, with the co-sponsorship of the American Astronautical Society and the Space Foundation, is offering a short course on "The U.S. Government Space Sector". Developed by the George Mason University School of Public Policy, Center for Aerospace Policy Research, the course will provide an overview of the departments and agencies, both civil and military, involved with U.S. Government space programs." By Keith Cowing on July 24, 2006 9:40 PM. Continue reading Skylab Restoration Project Needs Your Help. By Keith Cowing on July 24, 2006 8:57 PM. "From an exploration perspective we found that HMP despite the identified differences with a Lunar or Martian base is an ideal research environment for interplanetary logistics, because it: ..."
By Keith Cowing on July 24, 2006 5:37 PM. Editor's note: As NASA moves ahead with designing the second stage of the CLV (Crew Launch Vehicle) which will feature a single J-2x engine, people at several NASA centers have been looking back at the last time NASA flew an upperstage with a single J-2 engine: the S-IVB. The S-IVB was used on both Saturn 1B (second stage) and Saturn V (third stage) launch vehicles. Interestingly, the S-IVB was what Apollo used to perform the mission role that the new EDS (Earth Departure Stage) is being designed to do. Stay tuned. By Keith Cowing on July 24, 2006 11:02 AM. "The success of the Apollo program showed this country that if it truly set its full effort to a task, it could accomplish anything. Neil Armstrong, at the absolute center of the project, showed us we could do it without ego, and with dignity, and in so doing rise -- both literally and figuratively -- to our greatest heights." "Bush's 2007 budget calls for just a 3.2 percent increase for NASA, despite the need to fund the president's moon-Mars vision. If he and Congress are really serious about that project, they must agree to increase NASA's budget accordingly, even during an election year like this one when there is so much pressure to reduce the deficit. Space travel without space science is not a wise way to expand mankind's knowledge of the universe." By Keith Cowing on July 22, 2006 8:57 PM. "NASA chief Michael Griffin appealed on Wednesday to the leaders of the world's leading space agencies to join NASA in its bid to send astronauts to the Moon and Mars. Unless they do, he said, there will be little point in completing the International Space Station. The ISS will make a perfect staging post for such missions, he believes." Editor's note: It is kind of odd to see Mike Griffin taunting the nations who signed on to build the ISS several decades ago with the idea that the U.S. might not meet its part of that decades-old committment if these nations don't help bail NASA out of its most recent task: the VSE. Also, it is a little confusing to see Griffin cite the value of the ISS for Moon and Mars missions while simultaneously eviscerating the very science the ISS was supposed to be doing (biomedical) and eliminating the hardware required for that resarch - all of which would enable such long duration missions to be accomplished safely and productively. By Keith Cowing on July 22, 2006 11:02 AM. "From 2002 until this year, NASA's mission statement, prominently featured in its budget and planning documents, read: "To understand and protect our home planet; to explore the universe and search for life; to inspire the next generation of explorers ... as only NASA can." In early February, the statement was quietly altered, with the phrase "to understand and protect our home planet" deleted. In this year's budget and planning documents, the agency's mission is "to pioneer the future in space exploration, scientific discovery and aeronautics research." David E. Steitz, a spokesman for the National Aeronautics and Space Administration, said the aim was to square the statement with President Bush's goal of pursuing human spaceflight to the Moon and Mars." By Keith Cowing on July 21, 2006 10:58 PM. "The greenhouse is rigged with gadgets that monitor and water the plants mostly lettuce, with basil, radish and zucchini automatically. "The greenhouse this past winter was visited by polar bears," [Pascal] Lee said as he prepared to board a flight from Iqaluit to Resolute Bay last Thursday. "They knocked a big hole in the side of it." This season they'll give robotic gardening another try, along with other experiments." By Keith Cowing on July 21, 2006 12:01 PM. "The Associate Administrator of Aeronautics Research has informed NASA Langley that, based on the comprehensive restructuring of the Aeronautics Program, there is no NASA Aeronautics Program need for the B-757 beyond September 30, 2006." "...from ARMD's perspective, we do not see a need to specifically maintain the 757 in our arsenal." By Keith Cowing on July 21, 2006 10:56 AM. "Space Adventures, Ltd., the world's leading space experiences company, announced today that orbital spaceflight clients can now participate in a spacewalk during their stay aboard the International Space Station (ISS). Also known as an extra-vehicular activity (EVA), those clients interested in the spacewalk option have the availability to spend up to 1.5 hours outside of the space station." "NASA, which has grudgingly accepted Russian-initiated space tourism, would not comment on the proposal." Editor's 10:50 am EDT note: I submitted a few questions on this topic (below) to NASA HQ PAO this morning. Someone from NASA HQ PAO promptly replied: "We have not been informed by any of our partners about an intention to sell spacewalks. So I really couldn't speculate on the rest of your questions. But on your fourth question, I would point out that, as you know, the space station partnership has procedures in place to review things like crew assignments, EVAs, and any other proposals." Continue reading NASA Is Unaware of Space Adventures' Commercial ISS Spacewalks. RIF Threat Fading - Or Just Delayed? By Keith Cowing on July 20, 2006 3:40 PM. "The workforce protection language put forth by Senator Mikulski to defund any layoffs in FY07 is an essential component of the bill's effort to protect NASA's long-term institutional knowledge and capabilities from short-term expedient budget planning. The key to NASA's future success is to retain its current workforce while it recruits and trains the next generation of the best and brightest young scientists and engineers. This will only be possible if the Administration ceases its divisive and counter-productive layoff threats and shows the nation's youth that NASA is a great place for a stable, productive, and exciting career as a scientist or engineer." By Keith Cowing on July 20, 2006 1:40 PM. "Lockheed Martin Advanced Technology Laboratories (ATL) leads a team that will design a remote-controlled NAV, similar in size and shape to a maple tree seed. A chemical rocket enclosed in its one-bladed wing will power a sensor payload module more than 1,100 yards. Delivered from a hover and weighing up to 0.07 ounces, the module will be interchangeable based on mission requirements. Besides controlling lift and pitch, the wing will also house telemetry, communications, navigation, imaging sensors, and battery power. The NAV will be about 1.5 inches long and have a maximum takeoff weight of about 0.35 ounces." By Keith Cowing on July 20, 2006 8:19 AM. By Keith Cowing on July 19, 2006 9:25 PM. Editor's note: Mike Griffin states: "However, as we try to meet this challenge, the answer is not for NASA to re-organize or abandon one of its core missions to focus on the other two, as some pundits have recommended be done with our aeronautics research program." Then, a few moments later he says: "In restructuring our aeronautics portfolio, we are taking a long- term, strategic approach to our research to ensure that we pursue the cutting-edge of research across the breadth of aeronautics disciplines required to support revolutionary capabilities in both air vehicles and the airspace in which they fly." So, let me see if I understand this: it is unacceptable to Mike Griffin to "reorganize" NASA's aeronautics program - but it is OK to "restructure" the very same program. When you "restructure" something, don't you need to "reorganize" as part of the process? By Keith Cowing on July 19, 2006 8:29 PM. "As I have told Charles Elachi, I am sensitive to the impacts to scientists and engineers at JPL who worked on SIM. I have been laid off twice in my career." "Dear Mike: This letter of agreement ("Agreement") serves to acknowledge that your last day of employment at Orbital Sciences Corporation is August 24, 2001." By Keith Cowing on July 19, 2006 2:18 PM. Fuel leak blamed for rocket failure, AP"The Falcon 1 rocket, built by Space Explorations Technologies, launched March 24 from the Pacific island of Kwajalein Atoll. But the fire caused the rocket to fail 34 seconds after liftoff, investigators found." By Keith Cowing on July 19, 2006 11:00 AM. Reader note: "I just came from an "all-hands" meeting for the Flight Research Services Division (FRSD) at NASA LaRC. We were given official notice that NASA Langley has been ordered to mothball its B757 research aircraft. The 757 aircraft is to be stored at Dryden in a "flight-ready" status. Apparently the Hill was told this last night." By Keith Cowing on July 18, 2006 11:27 PM. House Science Committee Subcommittee on Space and Aeronautics Hearing: "The National Academy of Sciences' Decadal Plan for Aeronautics: A Blueprint for NASA? By Keith Cowing on July 18, 2006 9:47 PM. "Our autonomous greenhouse in the Arctic produces and manages its own power, has its own communications system for command and telemetry, and a robust data acquisition and control system for making measurements and maintaining the environment in the greenhouse. This project began in 2002 and every year we improve the systems and make them more reliable and more robust." By Keith Cowing on July 18, 2006 11:31 AM. By Keith Cowing on July 18, 2006 9:34 AM. "Discovery's seemingly unblemished flight raises some hope that a shuttle mission to rejuvenate the Hubble Space Telescope, NASA's most important scientific instrument, may prove feasible. Such a mission would be somewhat more risky than a trip to the space station because the astronauts would not have a place to take refuge were the shuttle orbiter to be damaged. But the scientific payoff, in our view, would be far greater than any likely research benefits from the space station." By Keith Cowing on July 17, 2006 10:06 PM. "The SPOC will be awarded as a sole source procurement under a Justification For Other Than Full and Open Competition (JOFOC) approved on September 13, 2004 to United Space Alliance (USA); and it is anticipated SPOC would contain a similar ordering provision for Constellation work. The period of performance for this effort under the SPOC will end September 30, 2010." By Keith Cowing on July 17, 2006 10:04 PM. "And he's so cool under pressure that when asked about his feelings after Discovery's successful July 4th launch, he said: "I'll have time for feelings after I'm dead." It's no wonder a NASA-watchdog Web site, nasawatch.com., parodies him with a photo manipulation that makes him look like the emotionless Star Trek Vulcan, the pointy-eared Mr. Spock." By Keith Cowing on July 17, 2006 6:36 PM. "During this mission, we are verifying this new, small spacecraft's systems and our procedures," said John Hines, the GeneBox project manager at NASA Ames Research Center in California's Silicon Valley, where scientists and engineers designed and built GeneBox. "GeneBox is an example of a low-cost spacecraft model that we hope will provide a short turn-around time for scientists, is responsive to their needs and that we feel will contribute to the Vision for Space Exploration." Editor's note: I find it interesting to note that at the same time that NASA is abandoning much of the cutting edge space biology research that was planned for the ISS, that the private sector seems to be developing an interest in this research - aboard a private space station. By Keith Cowing on July 17, 2006 5:24 PM. "Image 1: Genesis I with the Earth in the background. The module's orbit is coming from the dark side of the Earth into daylight. The arm on the right is a side view of a forward solar array. Image 2: The outer surface of the Genesis I's inflatable skin, including thermal insulation and debris protection." By Keith Cowing on July 17, 2006 9:14 AM. By Keith Cowing on July 16, 2006 1:50 PM. Editor's note: From Nano2Sol (link): "I came accross this press release today. Mike Constantine is selling signed hi-res panoramas but you can look at the pans online for free and really get a sense of what it's like on the moon." By Keith Cowing on July 15, 2006 5:00 PM. "We have extracted from early quick look data a low resolution thumbnail image of the Genesis I vehicle which verifies the success of vehicle inflation and solar array deployment. At this point in time, the vehicle is happy and healthy." By Keith Cowing on July 14, 2006 8:57 PM. "Flight rules stipulate that an APU is classified as lost if it is leaking hydrazine or engineers are unsure. The rule is significant because it means stricter weather requirements for Discovery's landing. In the unlikely event a second APU failed, the shuttle would be forced to land immediately at the next available opportunity. Shannon said the flight rule isn't applicable to this case because of the slow rate of the leak." By Keith Cowing on July 14, 2006 2:49 PM. "We drove a half hour out of town to the first transect site. The teachers separated and went with different scientist to collect samples of the rocks and soil. Our sampling tools consisted of sterile spoons, plastic gloves and zip-lock baggies. The scientists are all passionate about their work here and the teachers are excited to be doing real science along side the scientists. We were still working out the kinks of cooperation and communication. We kept hearing the term "herding cats", which was a good description of the progress of our group." Continue reading NASA Quest Spacewardbound Field Reports. Why Dress Silly in Space? He's Rich - Therefore He Can. By Keith Cowing on July 14, 2006 2:01 PM. "Previous reports have suggested that Enomoto plans to wear a red costume during his flight to emulate Char Aznable, a fighter pilot in the Japanese anime series Gundam." Editor's note: While on-orbit it would seem that Dice-K is going look like a cross between the cartoon character Calvin (i.e. Spaceman Spiff) and the 80's version of Michael Jackson. I wonder if he will transform into a giant robot during the mission and reboost the ISS. That would be so cool. By Keith Cowing on July 14, 2006 11:35 AM. "The Committee is concerned that NASA will neglect areas that only tangentially benefit or do not fit within, the proposed exploration vision. Specifically, the fiscal year 2007 budget request proposes to defer or cancel existing programs and infrastructure that are not directly supportive of the explorative vision. These appear to be the programs sacrificed to provide the near-term budgetary resources necessary to facilitate the implementation of the Moon/Mars vision." By Keith Cowing on July 14, 2006 11:13 AM. "For now, the mission is expected to proceed as planned. In fact, it's possible APU 1 might still be available for landing. Engineers could decide to start APU 1 in orbit and burn off the rest of its fuel to minimize the risk of hydrazine leaking into Discovery's aft compartment. Or they could choose to run the unit normally during reentry. The issue is expected to be discussed at length during today's mission management team meeting." By Keith Cowing on July 14, 2006 9:10 AM. "We recommend that Congress request a Comprehensive Long-range NASA Plan for Administration and Congressional consideration reflecting the priorities as outlined. Missions are to be stated and realistic estimates should be provided through mission accomplishment. Collaboration within the U.S. and with international partners must be considered in developing this overall NASA Plan." By Keith Cowing on July 13, 2006 9:06 PM. "NASA currently spends $650 million a year on Mars exploration, and that figure was projected to double by 2010. But as a result of the demands of the space shuttle, President George W. Bush's human exploration initiative, and cost overruns among other science projects, Mars spending now is slated to remain flat through that period." By Keith Cowing on July 13, 2006 7:05 PM. "As a result of these unforeseen expenses, NASA was forced to dramatically reduce long-planned funding to science, aeronautics, and exploration programs. Though the Agency has worked earnestly to mitigate the budgetary impact to other NASA programs of returning the shuttle to flight, the costs have been greater than the Agency can absorb. In some areas, the cuts have been so drastic that the continued existence of the associated research communities is threatened." By Keith Cowing on July 13, 2006 3:51 PM. "The amendment provides funds to reimburse NASA for the costs of returning to flight following the Shuttle Columbia disaster and implementation of the Columbia Accident Investigation Board recommendations. The funds will also provide relief for NASA facilities damaged by Hurricane Katrina. Vital research was being cut to fund emergency repairs; this will restore core missions for NASA science." By Keith Cowing on July 13, 2006 3:19 PM. GAO: NASA's James Webb Space Telescope Still Faces "Considerable Challenges"
"Although the JWST program recently revised its acquisition strategy to conform to NASAs acquisition policies, the program still faces considerable challenges because it has not fully implemented a knowledge-based approach, which our past work has shown is often a key factor in program success." By Keith Cowing on July 13, 2006 1:38 PM. "A proposal such as that suggested here may not make good sense or even be feasible. But it seems clear that US space policy will continue to face hard times unless policy makers begin to ask difficult questions that challenge the status quo. A proposal to break up NASA might be one way to open up such a discussion." Editor's note: According to its website, "The Office of Science & Technology at the Embassy of Austria in Washington, D.C. is a strategic interface for science, research and science policy between Austria and North America." By Keith Cowing on July 13, 2006 12:59 PM. "The AAS commends Senators Mikulski and Hutchison for their leadership in proposing an emergency supplement to NASA's FY07 appropriations that will help to compensate for the unexpected expenses associated with the Shuttle Columbia accident and damage to NASA facilities caused by Hurricane Katrina. This emergency funding request will alleviate severe cuts to NASA's space science program that are being taken to fully fund the Space Shuttle and the ISS -- costs for which there was never an adequate budget." Did Mike Griffin Talk About Embargoed '08 Budget Info? By Keith Cowing on July 13, 2006 12:20 PM. Reader note: With regard to an earlier NASA Watch posting SIM Slip Saves SOFIA and Other Projects "Rick Howard, the temporary replacement for Anne Kinney, made an off hand remark that since all discussion of the FY 08 budget is embargoed and that Griffin's talking about SIM and SOFIA have to do with the FY 08 budget he, Griffin, technically shouldn't have made those remarks." Continue reading Did Mike Griffin Talk About Embargoed '08 Budget Info?. By Keith Cowing on July 13, 2006 9:24 AM. "IFPTE, NASA's largest labor union, would like to formally solicit your support for the Hutchison-Mikulski Amendment. IFPTE believes that NASA urgently needs this emergency funding to allow the Agency to recover from the Columbia and Katrina disasters without pilfering its Aeronautics, Science, and Technology Development missions." By Keith Cowing on July 13, 2006 12:35 AM. "The WESH 2 I-Team asked to see the cafeteria inspection reports. In fact, we filed a Freedom of Information request with NASA in March, but we have yet to see those inspection reports to evaluate them independently." By Keith Cowing on July 13, 2006 12:05 AM. "Astronauts lose 2% of bone mass for each month they are exposed to the effects of microgravity. So far, astronauts have not been exposed to the increased radiation of outer space, but that will change when they undertake a proposed 30-month trip to Mars, Bateman said. NASA has focused on radiation's cancer-causing properties and its ability to compromise the central nervous and immune systems. But the effect on bone health is an unexamined concern." Editor's update: I am certain Bob Zubrin will fire out yet another ill-informed rant about how these experts don't know what they are talking about. C'mon Bob, fire away. By Keith Cowing on July 12, 2006 11:26 PM. Editor's update: seems that there is a lot of hallway chatter at MSFC - and elsewhere - about the advisability of switching from RS-68 engines to RD-180s for the CaLV - the prime issue being performance and the smaller booster diameter you could get (back to 27 feet) by going with RD-180s. There is also hallway chatter about the notion of dumping the CLV alltogether and considering an EELV such as the Atlas V. Seems that the current CLV has some difficulties (as designed) in getting the current CEV (as designed) into space. Editor's note: Word has it that internal studies done by/for Scott Pace's PA&E office show a growth in projected costs to complete the CEV program - by as much as $10-15 billion. In addition, individual lunar missions using one CEV, CLV, CaLV, LSAM, LSAS, etc. are now estimated to cost $5 Billion each. By comparison, Space Shuttle missions cost $0.5 billion each. "As to what it's all going to cost, our estimates are about--that it will cost for the first human lunar return, it will cost about 55 percent measured in constant dollars of what Apollo cost spread out over 13 years. Apollo was done in eight years. So, spreading it out over 13 years, it will cost about 55 percent of what Apollo cost, a specific number in today's dollars, about $104 billion for the first human lunar return along the lines of the architecture you saw today." By Keith Cowing on July 12, 2006 9:25 PM. "Small steps and giant leaps. That is what the opening of a frontier is all about," said the Foundation's Rick Tumlinson. "This small step towards the creation of an orbital station is actually part of a giant leap forward in the opening of space." "Aerospace mission control has begun to acquire information from the Genesis I spacecraft. The ISC Kosmotras Dnepr rocket has flawlessly delivered the Genesis I into the target orbit of 550km altitude at 64 degrees inclination. Bigelow Aerospace has received confirmation from the Genesis I spacecraft that it has successfully expanded. We have also confirmed that all of the solar arrays have been deployed." Reader comment: While Bigelow deserves the credit, our government deserves the blame. Continue reading Bigelow Launches Prototype Space Habitat. By Keith Cowing on July 12, 2006 11:37 AM. "We found many of the complainant's allegations of procedural flaws in NASA's conduct of the NRA to be substantiated, as discussed in detail below." By Keith Cowing on July 12, 2006 10:39 AM. "At the full Committee mark-up on Thursday, Sen. Mikulski and Sen. Hutchison will offer their amendment to pay back NASA for the costs of returning the Space Shuttle to flight. NASA has estimated the return to flight costs at just over $2 billion so far. Sen. Mikulski and Sen. Hutchison are committed to providing the $2 billion but will do so over two years, instead of one year." "Remember: Doing nothing will get us nothing." "Once again we write you from the SETI Institute to alert you to an important moment in the NASA budget approval process. Your help is needed." By Keith Cowing on July 11, 2006 5:21 PM. "NOAA is missing key elements that promote successful outcomes for complex developmental systems because it must adhere to Commerce's acquisition policies that do not support a knowledge-based approach. Without such an approach, the multibillion-dollar satellite investment that NOAA is in the early stages of acquiring is at a higher risk of not meeting program requirements." By Keith Cowing on July 11, 2006 12:25 PM. Editor's note: Last Thursday, Mike Griffin announced restoration of funding for SOFIA at a public meeting of the NAC Science Committee and Subcommittees. According to someone familiar with the discussions that followed Griffin's announcement, SOFIA will be funded by slipping SIM, which will be examined within the next Academy decadal survey, prior to proceeding to full development. While SOFIA is the most visible beneficiary, it was explained that the slippage of SIM solves problems with funding for GLAST, Kepler, JWST, and possibly HST servicing. The WISE mission will proceed, as planned. Editor's note: Several people in attendance noted that Griffin clearly appeared to be reading from prepared remarks. Those comments have not been posted by NASA PAO. Word has it that OMB asked NASA not to release them. Stay tuned. By Keith Cowing on July 11, 2006 10:48 AM. "While the space shuttle Discovery continues to lay the foundation for a manned mission to the moon, The Boeing Company is sending 89 public school teachers from around the world to the 15th Annual Boeing Educators to SPACE CAMP program July 10-16 at the U.S. Space & Rocket Center in Huntsville, Ala."
Editor's note: This is an excellent thing for Boeing to do and they are to be commended for doing so. Alas, I wonder how many more teachers (or students) could have been sponsored for the cost of the full collor, full page ad USA took out in the Washington Post today. What purpose these lavish, overtly self-congratulatory ads serve (other than being read by staffers on the way to work on the Metro every morning) usually escapes me. Then again, in this case, the USA ad has an overt educational theme to it, so I'll give them a pat on the back - this time - for trying to raise awareness of the importance of education. By Keith Cowing on July 10, 2006 12:03 AM. "As it was originally planned, the space station would be a facility for all users," said Donald A. Thomas, NASA's space station program scientist. "Any scientist with an interesting experiment to do -- combustion and fluid scientists, plant and cell scientists, crystal growers -- they could all come to NASA, and we would try to accommodate them. But our cutbacks and refocusing have changed that." By Keith Cowing on July 10, 2006 12:00 AM. What Are Those Things Coming Off Of Discovery? Answer: Tyvek! By Keith Cowing on July 9, 2006 7:32 PM. Editor's Update: Allard Beutel from PAO has confirmed that these are indeed Tyvek covers coming off of the RCS jets. Editor's note: just after Discovery cleared the tower several white objects seem to be coming off of the orbiter's nose and fall close to the vehicle. Are they pieces of ice? Tyvek RCS covers? See enlarged screen grab of successive frames. By Keith Cowing on July 9, 2006 6:42 PM. Editor's note: NASA has released a stunning movie taken of Space Shuttle Discovery as it drops its Solid Rocket Boosters taken by a camera located on one of those boosters. Editor's update: Additional STS-121 Solid Rocket Boosters Videos have been released. By Keith Cowing on July 9, 2006 2:52 PM. Editor's note: I had a chance to ask the crews of Space Shuttle Discovery and the International Space Station a question this morning. KEITH COWING: Keith Cowing, NASAWatch.com. You've arrived safely in space, and your shuttle is apparently OK for the ride home. As such, most of the general news media will now promptly lose interest in much of what you do up there. As a result most of the public is going to be more or less convinced that all you do is wake up to songs from the 60s and the 70s, float around and play with your food, take space walks, and send back pretty pictures. But they never get an idea of the true substance of what you're trying to do up there - and how it fits in with NASA's plans. This is an old problem - it's always lamented - but never fixed. What can you say right now - try it differently - try different words - so as to evoke the importance of what you are doing - for everybody. Continue reading A Serious Question About Space Exploration. By Keith Cowing on July 9, 2006 1:36 PM. 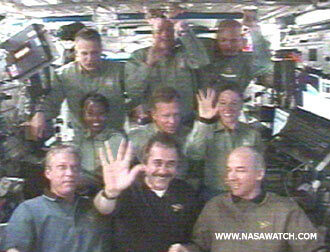 Editor's note: Robert Pearlman from CollectSpace.com wasted valuable crew time today when he asked the STS-121/Expedition 13 crew whether there were any Longhorns in space - since there are some Aggies up there. Pearlman did not ask anything remotely connected to the mission, its importance, the tasks the crew has performed, the challenges they faced, or even the classic "what's it like to be in space" question. Continue reading A Dumb Question From CollectSpace. By Keith Cowing on July 9, 2006 10:34 AM. Editor's update: Allard Buetel from PAO called: the item I noticed has never been included in the Execute Packages and is routine stuff about call signs, etc. Routine stuff. 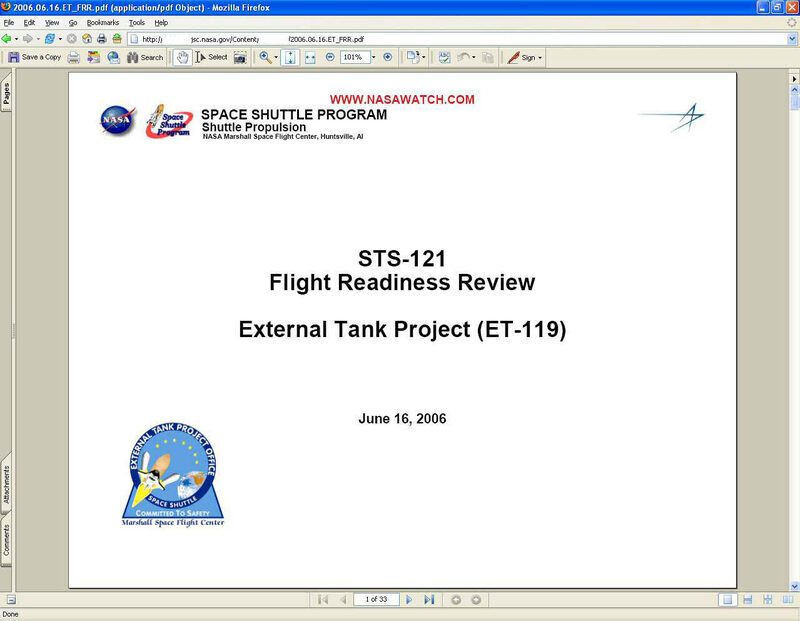 Editor's note: Have a look at the NASA STS-121/ULF1.1 FD 06 Execute Package. If you look carefully at the Message index (below), you'll see that NASA edited/excised/censored one small part. i.e. "MSG 43 FD06 Crew News Conference Message". MSG 42 and 44 are shown - but this one item is curiously missing. What is it about the information given to the crew about this media event that PAO does not want the media to see? I have asked PAO - let's see what they say. Continue reading NASA Deletes Messages About News Conference to Crew. By Keith Cowing on July 8, 2006 9:31 PM. Editor's note:The following is a transcript of an exchange during a STS-121 press briefing on 6 July 2006 with reporters participating on site at NASA JSC and by telephone from KSC and NASA Headquarters. The briefer at JSC was Lead flight director Tony Ceccacci. I asked if NASA could release the procedure document(s) that describe how NASA would implement a CSCS [Contingency Shuttle Crew Support] or "Safe Haven" scenario if a shuttle crew were required to await rescue aboard the ISS. Given that NASA has already posted the Space Shuttle Program Contingency Action Plan, NSTS-12820 Generic Flight Rules, and NSTS-18308 STS-107 Flight Rules as well as daily STS-121 Execute Packages, one would think that the release of this material would be a simple matter to accomplish. Alas, NASA did not say "Yes" when I asked. Instead they said "that's something we'll have to look into." Continue reading Implementing Safe Haven. By Keith Cowing on July 8, 2006 11:44 AM. Just as an example of how closely Big Brother watches, we would like to remind you remaining fluid in drink bags should not be poured down the WCS but stowed in Wet Trash (yes, they can tell). There is a concern that the additives may react with the oxone in the WCS to form precipitates, which may cause blockages in the waste lines. By Keith Cowing on July 8, 2006 11:36 AM. "After the launch of Shenzhou VII, a space station with 20 tons will be built, Song said, adding that Shenzhou VII will also be launched at Jiuquan Satellite Launch Center in Jiuquan, northwest China's Gansu Province." By Keith Cowing on July 7, 2006 3:30 PM. Editor's note: According to sources within the CEV contractor community NASA is now talking about moving CEV contractor selection from September 2006 to early 2007 (January). Stay tuned. 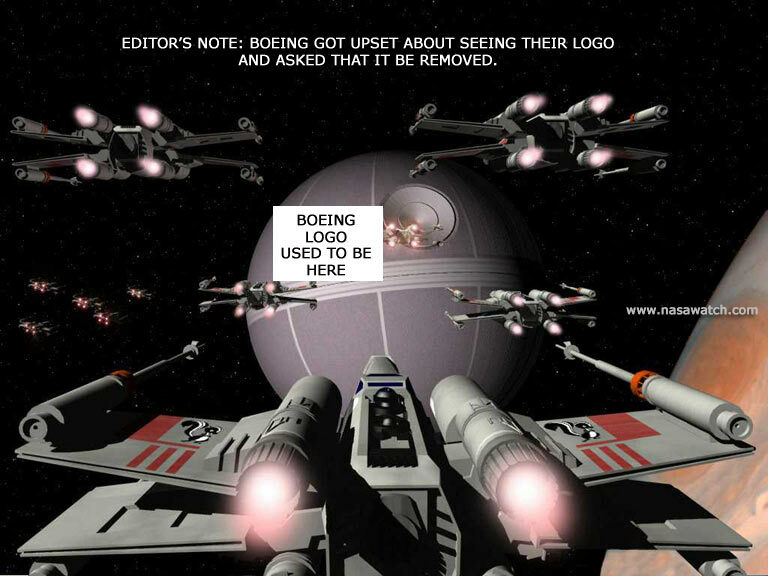 Meanwhile, someone at LockMart has a lot of free time on their hands - and is rather confident that they'll defeat Boeing. I guess they don't see Northrop Grumman as offering any value to the partnership. Gee, I sure hope that the LockMart folks have their English/metric conversions and systems integration process under control, that they lock the bolts on their turn over carts, and that they install the accelerometers in the right direction. By Keith Cowing on July 7, 2006 9:07 AM. "Independence Day always should make us proud that we still live in freedom in the leading nation on earth. But here at the Gateway to the Universe, there are sobering reminders that we sadly have frittered away the leadership we once had in space." Where do JSC Folks Go To Get FRR Charts? NASA Watch. By Keith Cowing on July 7, 2006 9:00 AM. Editor's note: It would seem that NASA's own document distribution system is somehwat dysfunctional. Have a look at this screen grab of the ET FRR charts originally posted on NASA Watch. They are now posted on a NASA server (URL modified to protect people's jobs). I suppose I should post more FRR charts so as to make sure that people at NASA have the data they need to do their jobs. By Keith Cowing on July 7, 2006 12:06 AM. "On Tuesday, July 4th part of the Mars Institute core team arrived at the HMP Research Station on Devon Island. Today, weather permitting, one flight is scheduled to go to Devon Island carrying cargo. As well the second charter has left Edmonton this afternoon on its way to Resolute with cargo and several participants including researchers from the Canadian Space Agency." By Keith Cowing on July 6, 2006 11:49 PM. "This assessment by the ad hoc Mars Architecture Assessment Committee (the members of the committee are listed in Appendix 1) was carried out at a meeting held at the National Academies' Keck Center in Washington, D.C., on March 29-31, 2006." By Keith Cowing on July 6, 2006 11:39 PM. "In a windowless warehouse in Crotona Park East, boxes of "Star Trek" memorabilia that were shipped from the part of the galaxy known as Hollywood are being cataloged and photographed. The catalogers and photographers work for Christie's, the auction house that more often handles impressionists and old masters. The trove will be sold for dollars. Not Federation credits." Editor's note: Several months ago I spent some time in another "windowless warehouse" in an undisclosed location on the West coast. While there I was interviewed for a special DVD being produced in connection with this Star Trek auction. Continue reading Beam Me Up. By Keith Cowing on July 6, 2006 11:43 AM. 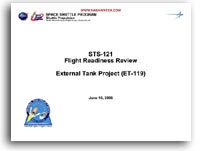 Continue reading Reader Feedback on STS-121. By Keith Cowing on July 6, 2006 11:08 AM. "On June 21, for the first time in its 28 year history, the SPATEA (SPAR Professional and Allied Technical Employee's Association) has gone on strike." By Keith Cowing on July 6, 2006 10:10 AM. "NASA has announced that Dorothy Hayden-Watkins, assistant administrator for Diversity and Equal Opportunity programs, is departing the agency. She served in her position since 2003." "Editor's note: NASA HQ sources report that Assistant Administrator Diversity and Equal Opportunity Dorothy Hayden-Watkins was escorted out of the building by NASA security personnel late last week." By Keith Cowing on July 5, 2006 1:32 PM. "The striking thing about this shuttle flight is that the most important task is simply survival of both the vehicle and the astronauts who are riding in it." By Keith Cowing on July 5, 2006 1:27 PM. "As Vice President for Legislative Affairs for the International Federation of Professional and Technical Engineers (local 30), I was dismayed by your effort last Wednesday to defund NASA's program to send humans to Mars and back. Your attempt was misguided for at least two reasons." "A debate broke out last week on the House floor as members debated the commerce-justice-science appropriations bill that has us asking, "What would Carl Sagan do?" Rep. Barney Frank (D-Mass.) kicked things off by offering an amendment saying that none of NASA's funds could be used for a "manned space shot to Mars." Continue reading Spaced Out on The Hill. By Keith Cowing on July 4, 2006 11:37 PM. Editor's note: When asked what his feelings were during the launch of Space Shuttle Discovery this afternoon, Mike Griffin replied that during the launch he was busy "looking at data" and that he was "not aware" of what his feelings were. Later he said "I'll have time for feelings after I am dead." According to this official NASA photo, Mike Griffin apparently did watch the launch - either that, or everyone is looking at a Jumbotron with "data" outside the windows. In this picture and this picture he's even using binocculars. Hardly the best way to look at "data". C'mon Mike. This Spock impression schtick is getting to be a little creepy. Admit it - you run the agency more like Scotty. Lighten up. By Keith Cowing on July 4, 2006 7:32 PM. "The crew has sent down video of the mystery object that astronaut Mike Fossum saw floating away from the shuttle while he was doing routine filming of external-tank separation. NASA says preliminary analysis indicates that the object is ice." By Keith Cowing on July 4, 2006 5:21 PM. "Speaking now in a news conference, managers say that engineers already have noted foam loss in two separate incidents. 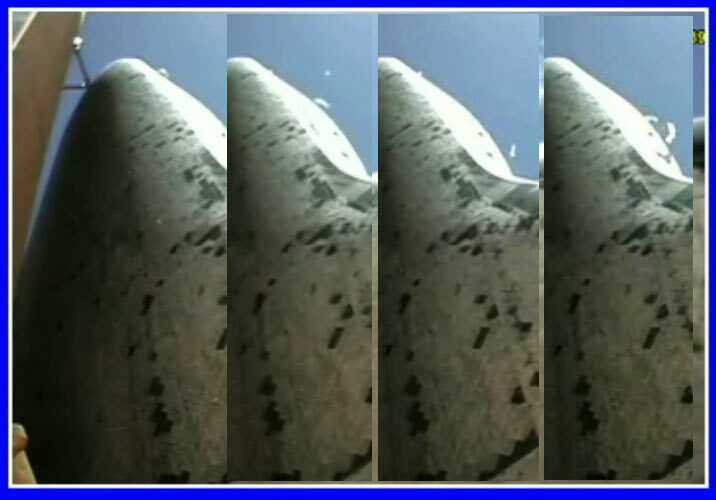 Shuttle program manager Wayne Hale said three or four small objects appear to break off the tank about 2 minutes, 47 seconds into flight. Then more debris is seen liberating from the tank about 4 minutes, 50 seconds after launch." By Keith Cowing on July 4, 2006 5:00 PM. "U.S. National Security Adviser Stephen Hadley said there were five missile launches in all. One was the Taepodong-2 missile, and the other four were short-range. A short time after Hadley spoke, North Korea launched a sixth missile, U.S. military sources said." By Keith Cowing on July 4, 2006 4:40 PM. "... And then when reporters tried to get documents that went with this review, the Flight Readiness Review, NASA refused to post them, even though they had put the very same documents out for the public to see before Eileen Collins' mission. ... I got a hold of one of those documents that had to do with the external tank and I posted it on NASA Watch." Reporter: "Now that it is launched can we have the FRR material?" By Keith Cowing on July 4, 2006 4:17 PM. "COWING: Well, the issue here is not so much the technical decision, it's just NASA's inability to be very clear in explaining what it is they decided. In the original Flight Readiness Review decisions they said, well, we're "no go" because something can happen to the vehicle, but we're OK with the mission. Now, that sounds a little oxymoronic..."
By Keith Cowing on July 4, 2006 3:01 PM. Editor's note: The Space Shuttle Discovery launched today at 2:37:55 pm EDT with no apparent problems. The shuttle is currently scheduled to return the morning of July 16. There appears to have been some foam shedding. Video and pictures will be analyzed by the mission management and imagery analysis teams over the next few hours. By Keith Cowing on July 3, 2006 9:19 PM. Editor's note: I filmed an interview with WTTG-5 (Fox) which will air in Washington DC at 10:00 pm EDT Monday night. I am scheduled to appear on NPR's Day to Day Tuesday morning at 10:30 am EDT, and on CNN's Pipeline and CNN TV launch coverage Tuesday afternoon. By Keith Cowing on July 3, 2006 9:00 PM. Editor's note: After examining the foam loss issue in depth, NASA has decided to continue the count for a launch attempt tomorrow. "NASA continues to prepare for a third launch attempt for STS-121 while dealing with foam shedding issues. 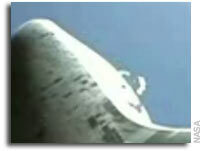 During an inspection of the Shuttle's External Tank it was discovered that an external liquid oxygen line outside of the tank apparently shed a very small piece of foam as a result of the expansion/contraction of the tank that results from the loading and unloading of cryogenic propellants. The piece weighed .00577 pounds." "During a pad "walkdown" Sunday evening, inspectors found a crack on the shuttle's external fuel tank near a bracket that holds an oxygen feedline in place. Later, a chunk of foam that apparently fell from the area was found on the shuttle's mobile launch platform. It is not clear yet what, if any, impact this will have on Discovery's planned launch Tuesday. The Mission Management Team is scheduled to hold a special meeting to discuss the issue at 10 a.m. this morning. The following is a copy of the inspection team's report: ...."
By Keith Cowing on July 3, 2006 7:11 PM. "You guys feel free to enjoy these vaguely dirty (in a sophomoric way) photos from the NASA "We're Still Incompetent" presser, courtesy Getty Images. We couldn't pick just one to snicker at, so there are more after the jump." By Keith Cowing on July 3, 2006 2:19 PM. "NASA's latest attempt to get a shuttle into space has hit all kinds of problems, we ask whether the disarray at the pioneering agency could lead to its total decline. Keith Cowing, a former NASA scientist and editor of NASAWatch.com, tells us what the future has in store." By Keith Cowing on July 3, 2006 12:08 AM. "GRIFFIN: Well, the folks who wrote that editorial are living two years in the past. That debate was held. It was held on a national level. It was extensive. And at the end of all that, two years ago, following the loss of Columbia -- three years ago -- the president decided to continue with the space station program and to allow the shuttle to fly out to an orderly retirement in 2010." Editor's note: Yea Mike, but that date was chosen assuming that there would have been a return to flight by mid-2004 and that we'd have had as many as 10 flights by now (using your 4.5 flights/year rate). We've only had one flight. That's 9 less flights to complete the ISS. Have you ever raised this point with the White House? By Keith Cowing on July 2, 2006 11:48 PM. "THE VICE PRESIDENT: Sure. I was down here -- when I was a member of Congress, early in the program in the '80s -- really looking forward to today; especially looking forward to having my grandkids here. But it's not to be today, and maybe it'll work tomorrow." Continue reading NASA Provides the Veep With The Right Fuel. By Keith Cowing on July 2, 2006 11:42 PM. By Keith Cowing on July 2, 2006 10:24 PM. "The first charter plane arrived in Resolute Bay yesterday on schedule with the initial Mars Institute core team and cargo. Another charter with personnel and cargo is scheduled to arrive in Resolute on Wednesday, July 5th." By Keith Cowing on July 2, 2006 8:28 PM. "NASA's launch of Space Shuttle Discovery at Kennedy Space Center, Fla., was scrubbed again today due to inclement weather. The primary concern was the presence of showers and thunderstorms within the surrounding area of the launch site. The next launch attempt for Discovery's STS-121 mission to the International Space Station is scheduled for Tuesday at 2:38 p.m. EDT." By Keith Cowing on July 2, 2006 11:06 AM. 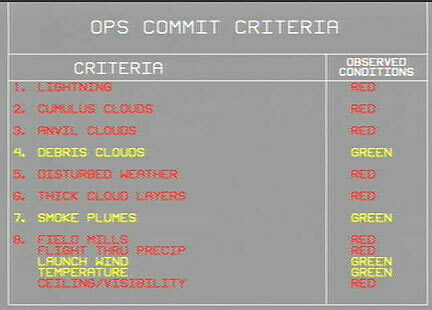 Editor's note: The following image showing Ops Commit Criteria, was shown on one of the KSC video feeds at 11:00 am EDT. With all the red (no go) ratings under "observed comditions", It doesn't bode well for a launch today. "If we scrub today due to weather, mission managers will meet later to decide if they want to make a third consecutive launch attempt or stand down for one day and try again on Tuesday." By Keith Cowing on July 2, 2006 8:56 AM. "NASA's official overall probability risk assessment number (PRAN) for complete loss of life and vehicle for the Space Shuttle remains at the widely quoted 1/100. Theoretically, there's a one percent chance of catastrophe. While the agency stresses that Space Shuttle flights are extremely dangerous missionssending humans into space always isofficials worry that the risk has been overstated. According to NASA, in practice, it's not as bad as it sounds." By Keith Cowing on July 2, 2006 12:43 AM. By Keith Cowing on July 2, 2006 12:00 AM. Editor's note: I will be a guest on CNN's Pipeline starting around 1:00 pm EDT and a little later, on CNN as part of their launch coverage for STS-121. "... perhaps they need to hire some media types and teach them a little engineering, somewhere in the mix you might a better explanation for things. Oftentimes it's [not] NASA's technical abilities, [but] it's ability to relate, not only decisions it's made but also what it's doing and why that's important to a broader audience. So this is a bigger and more long-term problem that NASA's had -- communicating clearly with the public." By Keith Cowing on July 1, 2006 10:32 PM. Editor's note: Renowned Information presentation guru Edward Tufte has some comments on this PowerPoint presentation. His comments on NASA's reliance upon the PowerPoint crutch and the pitfalls with using this crutch - appear in the CAIB's final report. NASA also invited him to make a number of presentations across the agency several years ago. Alas, all of his suggestions seem to have been forgotten. Go to his page here and scroll to the bottom (but once you've read the latest entry, take some time to start at the top and work your way through). "The tone and style of the presentation seem alienated from professional engineering. It almost looks like the slides were prepared by a PP designer, assisted by several engineers. Or maybe it is just the PP pitch style. I hope the actual engineering for the shuttle is a lot better than the evidence for the engineering shown in this presentation." By Keith Cowing on July 1, 2006 6:02 PM. "Today's launch of Space Shuttle Discovery has been postponed for 24 hours because of weather. The preferred launch time for tomorrow is 3:26 p.m. from Kennedy Space Center." By Keith Cowing on July 1, 2006 9:51 AM. Editor's update: The launch has been scrubbed for today. NASA will try again tomorrow at 3:26 pm eastern.